I tend to see products for market along a “spectrum of saleability” with raw materials at one end and increasingly refined products at the other. Raw materials generally have a smaller market since they require further processing to make them useful. Very refined products also have a small market because they have so much value added that they are expensive and they may also have very specific uses. To have the greatest market appeal a product should be somewhere in the middle to keep the price down while having the greatest utility to the most people. With wool, most people want the initial work of cleaning and carding done because that really is a lot of work without the right equipment. At that point your product is going to have more interest because many spinners don’t really like spinning wool “in the grease.” However, even spinners are really working towards yarn to make whatever they ultimately want to make. Getting the wool into yarn drastically increases potential customers, but your product is now on the cusp of getting kind of expensive for anything larger than socks, hats, and other small garments. A handmade sweater is fairly expensive even without putting a price on the time to make it. So perhaps yarn is the right point to stop processing ones raw wool and to put it in front of customers. Despite these consideration, I really want cloth made from our own flock. I am not a knitter, although Lynda is a prolific one, and knitting is simply not the right approach for many items. I can see myself as a weaver, although that is currently on the long list of skills to acquire. Luckily, my work at the Battenkill Fibers Carding and Spinning Mill has put me in touch with Lilly Marsh, a weaver in Queensbury. We got a chance to visit Lilly and her husband Mike to see her workshop and to start to get a sense of direction towards our own cloth. First of all, there is a hell of a lot more to know about weaving than the difference between warp and weft. Which of course is obvious, but I was surprised at the amount of variables there are to consider and just how much of a mechanical machine even a simple loom is. Essentially any piece of cloth is composed of threads that criss cross each other yet the possible variations are pretty much infinite. The truth is, I came away with more questions than answers and I feel like we have only dipped a toe into this field. One detail I’m glad to know is that the right yarn can be used to create a variety of cloths. This is possible by having one type of yarn spun, keeping a portion as single ply, and then making double and triple plies from the rest. Through different combinations of warp and weft numbers and thread types we can make soft and comfy to rugged and hard wearing. Which is great since we would like to use our cloth to make garments, blankets, and bags. The next step is sorting our wool clip into colors and types which is probably going to have to wait until warmer weather because that is bare finger work in a large area. These photos are from Lilly’s Facebook page . She also has an Etsy page. It has been eight months since my last post and I would like to say that we have made a lot of progress developing the farm, but unfortunately that isn’t the case. Although, there have been a number of shifts important to that end. Looking back over the past year, the pattern is one of wrapping up and giving up long standing projects and work relationships that distract from long term goals. From 2012 to 2017 our primary task was to renovate and make mortgageable our new property. What I haven’t mentioned in previous posts is that I was also enrolled in a PhD program that was put on hold at the end of that time period, as well as considerably slowed over the whole duration. A little more than half of last year was spent attempting to finish, while becoming increasingly aware that the degree no longer made sense for my direction. In the end I realized that I had to walk away. Although I still feel this was the right decision it wasn’t easy and there is still regret. At the same time, Lynda has been working on a doctorate in education, which she is wrapping up now. In our re-enactment lives, we committed ourselves to what turned out to be a considerable amount of time. Although it was well worth it, it’s good to be able to reduce our time commitments. In addition to all of this, there is regular work. A good thing that came out of the PhD research was exploring the rural entrepreneurial literature. From that, we were inspired to hold brain storming sessions with our neighboring farm owning friends in which we laid out independent and collaborative possibilities. These occurred in the early part of the year. With the onset of Fall, I looked back at how little progress we were able to make towards those goals. This caused me to wonder, just what does it take to shift direction and create something new while we are preoccupied by the routine of daily life. Which it turns out, is pretty demanding. How do we jump out of our ruts? First of all we need to decide what our long term goals are and what we can do to promote them. To that end, I sought out employment that would support our long term goals rather than distract from them. I found it at our local fiber mill, Battenkill Fibers Carding and Spinning Mill. At first I was very part time, at only two days a week. However, the effects of the government shut down provided an opportunity to consider moving away from my former employment all together and I am now working there nearly full time. What I hope to achieve beyond a pay check is support for our farm through connections with people, access to information, development of skills, and an immersion in the world that is my occupation. The point of this is not to write a personal “tell all,” but an effort to describe what we are finding it takes to reposition ourselves to make a serious effort to farm. Obviously this process isn’t limited to farming, but is common to any attempt to follow ones passion. My first job at the fiber mill has been the assembly of a spinning frame that was bought from a mill in Portugal and sent here by ship. It came without instructions of any kind and it has been quite the learning experience. The lead on this project is a retired engineer and degree holding physicist whose wife is a professional weaver. In my next post I’ll talk about our visit to her weaving studio through which we hope to eventually make cloth from our own wool! As a fiber farmer and former fiber processor I have often contemplated what I call entrepreneurial fiber farming and the fiber arts community. I differentiate this type of farming from more traditional sheep farming, which I refer to as commodity fiber farming. Commodity fiber farming supplies wool in bulk through collection points such as wool pools, selecting for uniform characteristics that lend themselves to a consistent product. Entrepreneurial fiber farmers supply small quantities of many different types of fiber directly to fiber artists through direct sales on the farm, at fiber shows, farmers markets, and on line. The primary question I ask, is how can this become an industry that contributes to the fundamental need of putting clothes on peoples backs from local farms? Currently the fiber arts community consists of farmers, processors, show organizers, media, celebrities, and consumers who are all part of a niche market directed at creating one of a kind art pieces and hand crafted articles of clothing. Essentially we are producing luxury goods in that they are not a part of peoples base line, everyday wardrobe. For that we get our mass produced clothes through the same outlets as everyone else. The reality is that we don’t actually have to shop anywhere else to cloth ourselves. Personally, I would prefer to be involved in work that is meaningful in a fundamental way by contributing to real needs. Of course art, nice things, and experiences have aesthetic values that fulfill a genuine need that contributes to happiness and health. I have worked very hard to live in a place of great natural beauty because art, nice things, and experiences mean a lot to me. However, I want to know that my work also contributes in a fundamental way. I’ve come to the conclusion that the fiber arts community does contribute in fundamental ways through the preservation and development of fiber and textile skills and knowledge, and the preservation of fiber animal breed diversity. Although none of us fundamentally need nalbound naturally dyed socks made from an icelandic/alpaca wool blend that was hand spun and made on bone needles, the people that did all that are preserving a host of things that the world would be poorer without. In addition, although I don’t want to sound like a preper for the apocalypse, someday all of this might come in really handy should the availability of mass produced clothing come to an end. As the snow allows, I have been continuing to clear a one and a half acre pasture I started last winter. The land is cleared and now it is time for fence posts. Given the winters we have now, I get a lot of opportunity for outside work that requires bare ground or is at least much easier without snow. Today I started splitting out locusts posts from a collection of large logs set aside for the purpose two winters ago. If you are unfamiliar with black locust, it is one of those trees that defies the norm in that it grows fast, but is a very hard wood. For all intents and purposes, it also does not rot. I’ve found logs lying in the ground for at least a decade that were completely solid and made perfectly good firewood. In fact, the older it is the harder the heart wood gets. I suspect it has a heavy duty anti-bacterial agent of some kind, since the sap from the bark will sting your eye and slivers from it burn a little. This post is a picture series I took splitting out the first post. Just 99 more to go! In my last post I discussed how we got our start with animals and farming and the journey from our old property to this one. In this post I will discuss the influences that we work to include in our farm business. Natural materials: It is probably not surprising to see natural materials as an influence in a farm given that the products come from the land, and you can’t get more “natural” than that. However, we extend that beyond the products we produce to our own tools, packaging, display stands, animal housing, and feed as much as we can. Historical reenactment: History has always been an interest of mine and as a teenager I was introduced to historical reenactment of the French & Indian War and Mountain Man eras through nearby events held at the Old Saratoga Muzzle Loading Club next door to the Saratoga National Historical Park. As an adult I explored the early history of Europe and the British Isles which tied in well with what I know of my genealogy. Through a friend I was put in touch with a reenactment group focused on the viking era. As a result of all of this, (yes, it is my fault) both Lynda and I are now thoroughly involved in viking era historical reenactment and we hope to make it a theme in our farm business. Primitive breeds: Once we discovered primitive breeds we never looked back. We love the variety of colors, fleece types, and personalities. We also like their hardiness, their ability to do well on hay and pasture alone, and that they are repositories of genetic diversity. 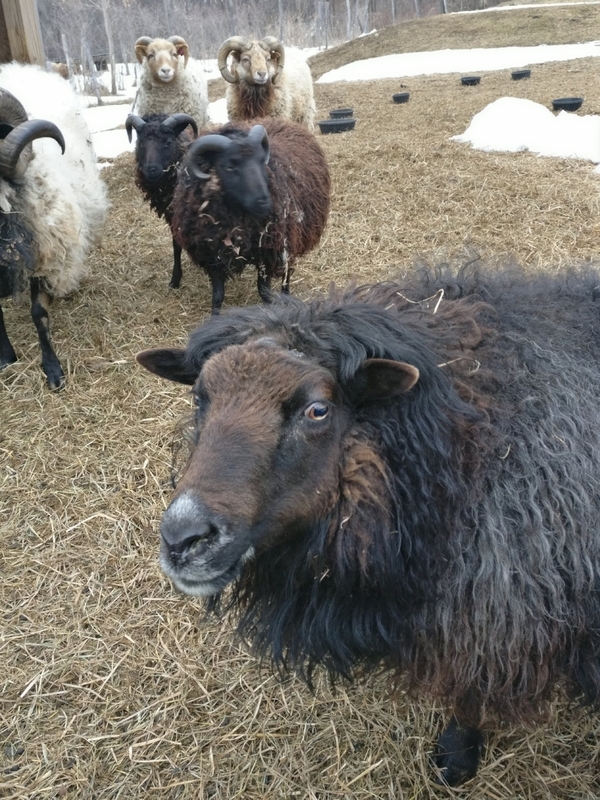 The primitive breeds we have kept or have now are Shetland sheep, Icelandic Sheep, Black Java Chickens, and Scottish Highland Cattle. Currently we have Shetland and Icelandic sheep. We have kept Shetlands for twenty years and have just recently added Icelandics. Both of these breeds appeal to our sense of heritage and their origins in the Shetland Isles and Iceland. In addition, their wool is among the best wool I encountered while processing many different breeds wool in our fiber mill. Given how well these breeds fit into our reenactment perspective, we decided we should have both. In time we also intend to have highland cattle again, and black javas or another interesting old chicken breed. Community: Our experience establishing a fiber mill, and running a farm generally, impressed upon us the limitations of attempting this type of endeavor as a solo couple. With one person working full time and the other combining various employments with farming, it can be very difficult. Consequently, we are developing a working relationship with another local farm to share resources and provide mutual assistance. This is new territory for all of us, and we are working it out as we go. Their farm is Luina Greine Ferme which is Gaelic for Sunset Hill Farm. A long time ago, in a town not really that far away, Lynda and I bought a house with a little bit of property. Our own place to do whatever we wanted with. Soon after there was an offer of some free older hens, the old metal shed could serve as a temporary hen house. Then Lynda took a spinning class. Then she was offered a couple of free sheep. We could use temporary fencing for the front yard. Then we went to a sheep & wool show and decided to check out the auction, and another sheep came home. Then I discovered Scotch Highland Cattle at the local highland games and a breeder just twenty five minutes away. We could make a barn yard in the woods behind the house! Which is what we did, and then I just kept building things that should have been built before we got any animals at all. Eventually the infrastructure caught up and our knowledge increased. At one point or another we had cattle, pigs, goats, sheep, chickens, and bees. During that time we also started a fiber mill processing animal fibers and our own shetland wool, with wholesale egg sales to an organic foods store. All of these endeavors were intense experiences with steep learning curves. However, in the end only the chickens and sheep remained because we just didn’t have an appropriate property to support anything more than a few laying hens and a handspinners flock. We lived at that property for seventeen years and dreamed about a better property for most of that time. The problem with using your property as a place to try out one experiment after another is that you end up with a place that probably isn’t ready to go on the market anytime soon. An old house with several additions that were never really finished by a person learning how to work on houses as he does it, leaves you with a long list of must do’s before you try and sell. Combined with the pressure of wanting to move to another school district as our children finished elementary school left us feeling trapped. So we decided to give away what sheep we had left and simply move out by renovating a portion of a famly friends old farm house which we would then rent. With our house empty, it would be much easier to finish it and the kids would be in a better district. We made the move in the last week of August 2009, and then the effects of the 2008 economic crash reached us in October. We lost our primary income and were left with unemployment and my part time adjunct professor pay. Luckily a potential tenant appeared through word of mouth and we didn’t lose the house. The old farm house we were living in was uninsulated and had two woodstoves for heat. It was a very cold winter! During that first winter, insulation and repairs improved the situation considerably and we made the best of it for about three years. During that time we started a new small flock of shetland sheep and kept a few chickens. As our finances improved we started looking for property and eventually found the one we live on now. It has been a very long road, we finally sold the old house, our kids have grown, and we live in a very nice old house on a piece of property with lots of potential. Our flock is around twenty animals and includes both shetland and icelandic sheep. And we still have chickens! All of the Shetland fleeces are sorted and skirted and will go to the mill tomorrow. About half will go into roving, the rest will be yarn. I have quite a bit of yarn left from the last time we had fleeces processed three years ago, so getting some roving to sell is a good idea. We have to skirt fleeces this weekend- if anyone would like to help?